This page contains pictures and information about Paropsine Leaf beetles of Genus Paropsisterna (former Chrysophtharta)) that we found in the Brisbane area, Queensland, Australia. 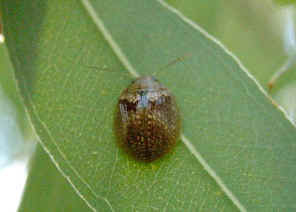 The genus Paropsisterna has been recently expanded to include Chrysophtharta. They are native to Australia and New Guinea. There are more than a hundred species in this genus in Australia. 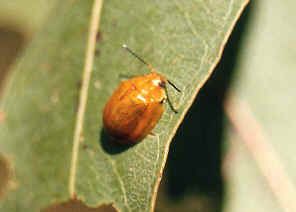 This Leaf Beetle are sometimes found on young Eucalyptus tree in Brisbane forest from late spring to summer. They are golden brown in colour. 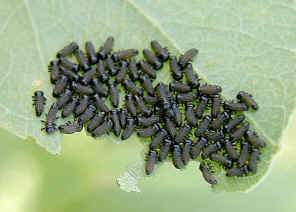 We found some of their larvae and raised them into adults. Check this page for the details. 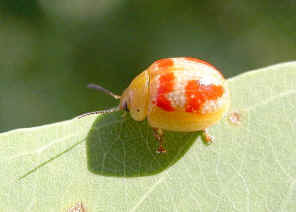 This beetle run quickly on stems. It drops and flies away if we come too close. 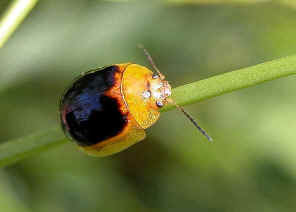 The beetle is dark with yellow edges. Its thorax and head are yellow. 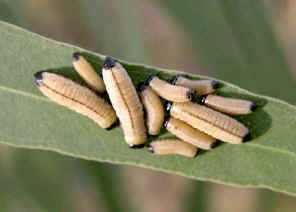 A few of the beetles were found on the same young gum tree. 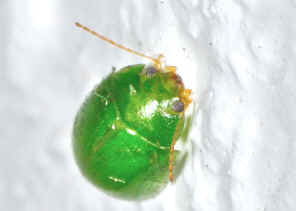 The beetles were found in Karawatha Forest during mid summer. More information and pictures please click here. 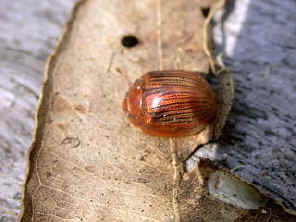 We saw the beetle once in Karawatha Forest during mid summer. 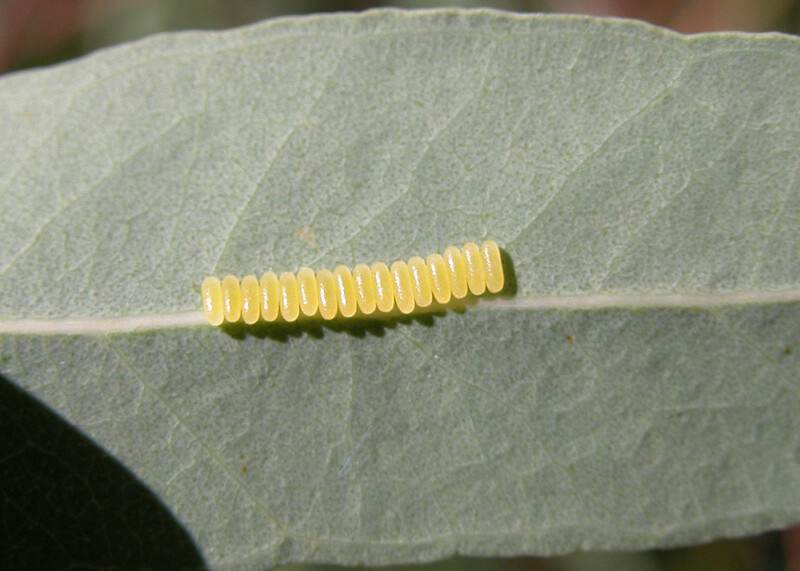 It was resting on leaf of a young gum tree. 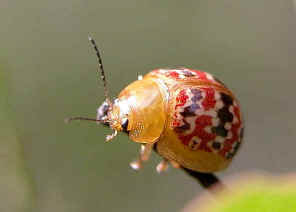 The beetle has the very colour patterns on its wing covers, with red, black and white colours. When we came very close, it dropped onto the ground and disappeared. For more pictures and information please click on here. 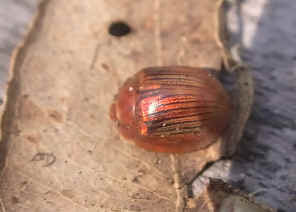 We found this beetle many times in Karawatha Forest during mid summer. 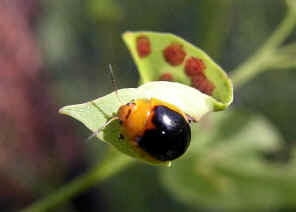 When disturbed, this beetle released a small dropping on leaf. We believed this is a kind of defense behavior. More information and pictures can be found in this page. We found this green leaf beetle on wall outside our house on Sep 2010. We believed it is in this group but did not find any information about it. 1. 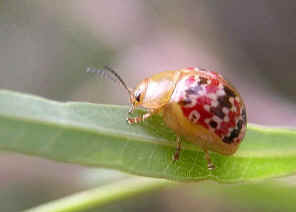 Paropsisterna Motschulsky, 1860 - Australian Biological Resources Study, Department of the Environment and Heritage, Australia 2005. 2. A taxonomic revision of the Australian Chrysomelinae, with a key to the genera (Coleoptera: Chrysomelidae) - Reid, C.A.M., Zootaxa 1292, 2006. 3. 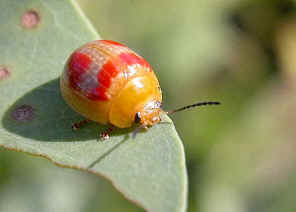 Key to the Chrysomelinae of New South Wales - FaunaNet, Australian Museum, 2003. 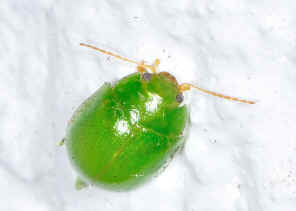 4. eucalyptus tortoise beetle Chrysophtharta spp. - PaDIL, Pest and Diseases Image Library, 2007. 5. Eucalypt leaf beetles Paropsisterna spp. - PaDIL, Pest and Diseases Image Library, 2007. Last updated: February 28, 2011.